The first time I was told to “check my privilege,” I’ll be honest, I was angry. I was defensive. And most of all, I was offended. It’s not like my life had ever been particularly easy. Growing up with bipolar disorder and being queer, I often felt like I was fighting an uphill battle. So for someone to suggest that I was privileged? “Oh please,” I said to myself, “They have no idea what my life has been like.” In no uncertain terms, I told that person to go kick rocks. And now, years later, I can say without a doubt that I was wrong. And chances are, so do you. Because we all carry around privilege of some kind. For example, growing up, I came from a middle-class background. I never experienced food or financial insecurity. I didn’t have a job while I was in high school, and I was able to attain a good education. It was assumed, by default, that I would be high-achieving. As a result, my teachers invested a lot in my success. In contrast, poorer classmates that I knew experienced near-constant food and financial insecurity. As a result, this impacted their focus, their emotional wellbeing, and their grades. Teachers simply assumed that they were “lost causes” that didn’t care about their schooling. Consequently, they didn’t spend as much time mentoring those classmates as they did mentoring me. Does this mean I didn’t struggle, too? No. Does it mean that I’m a bad person? Nope. It simply means that I gained an unearned advantage, in comparison to other people – by no fault of my own, but rather, because of prejudice. We, unfortunately, live in a society that carries a great deal of prejudice on many different levels – and this impacts the way that we are treated. Often times, our laws and other institutions can reflect this prejudice, too. And the result is that people end up with advantages and disadvantages, depending on their intersecting social statuses – things like disability, race, a/sexuality, gender, class, and much more. And this – only this! – is where the idea of “checking your privilege” comes from. Yes, it’s okay if your initial reaction to being asked to check yourself was not a pleasant one. It can be uncomfortable to be asked to reflect on these issues. It can be especially uncomfortable if, like me, you just didn’t know how. But before we talk about what “checking your privilege” really is, we should talk about what it isn’t since there are a lot of myths about it that impact how we understand it. When someone is asking you to check your privilege, they aren’t trying to insult you. After all, it’s not like these privileges are something you asked for. It’s not like you’re thrilled that society is unequal. In most cases, we don’t even notice that we have these privileges in the first place. They’re asking you to be compassionate towards the particular struggle that they’ve had, and to acknowledge that their struggle has been different from yours. They want you to acknowledge and reflect on the ways that your lives and your backgrounds are different. Asking for compassion isn’t really an insult. It’s actually a compliment when you think about it, because they’re assuming that you can rise to the occasion and that you’re capable of demonstrating the kind of empathy that’s needed. Having privilege says nothing about whether or not you’ve had a difficult life. You can have privilege in one aspect of your life, while having struggled or encountered disadvantages in other ways. I may not know the struggles of someone with a physical disability, but I have struggled as a transgender person; I may not know what it’s like to be a person of color, but I do know what it’s like to live with a mental illness. As you can see, I’ve definitely struggled in some ways. Similarly, even the most privileged person can encounter difficulties, because life itself is full of challenges. “Checking your privilege” isn’t about conceding that you’ve had an easy life. It’s about acknowledging that there are certain struggles that you will never encounter that are very specific to certain groups of people. When I walk into a building, for example, I don’t question if I can get to the office where my meeting is. I don’t go to a concert venue and wonder if there is a seat I can access. And when I apply for housing and I’m told there’s no elevator, it’s not a deal breaker because I can still safely reach my apartment. Acknowledging that there are struggles we don’t share doesn’t invalidate the difficulties you’ve faced – it just recognizes that those difficulties can vary based on our identities, and our lives and our experiences can be drastically different as a result. If your gut instinct is anything like mine, you may feel an urge to defend yourself. It’s true – no one knows your struggle the way that you do. Instead of ignoring and invalidating someone else’s struggles, this is a great opportunity to demonstrate compassion and learn about what it’s like to walk in someone else’s shoes. Challenge yourself to be present (I know it’s hard!) instead of opting out. Sometimes our first impulse is, instead of taking the time to research on our own, to demand that the person who called us out become our teacher. After all, they called us out, right? So they should probably finish the job! But while it’s great that you want to understand, it can actually be really problematic to make these demands. It can be upsetting, stressful, and exhausting for someone who is oppressed to open up about their pain just to educate someone who doesn’t understand. As such, it’s important to be respectful and not place demands on this person. Being asked to reflect on your privilege isn’t an invitation into their personal life. It also operates under the assumption that you’re entitled to their time, their energy, and their trauma. But that’s not the way this works. You can’t just go up to someone and demand that they take the time to teach you something. Your education isn’t their responsibility – it’s yours. So, please, instead of demanding that someone take the time to help you, try first doing a little research on your own. Okay, So What Is Checking Your Privilege? Being asked to “check your privilege” gives you a chance to do some serious reflection on both your own life and the lives of others. You can start with researching. Everyday Feminism has a whole bunch of articles about different types of privilege. And if you can’t find what you’re looking for, there’s an abundance of resources out there in the great Interwebs. What sorts of things do I take for granted as a member of a privileged group? How are my experiences different from those of a disadvantaged group? Why do these differences matter? What do they look like in the real world? For example, as a white person, if a police officer approaches me, I can almost always be sure that they aren’t approaching me with the assumption that I don’t belong, or that I’ve done something wrong. This is something that I definitely took for granted for most of my life. However, many people of color don’t have this privilege of assumed innocence; many people of color experience racial profiling by the police, meaning it’s assumed they’ve done something wrong, even in the many instances in which they haven’t, based on their skin color. It’s also true that altercations between the police and people of color are statistically more likely to turn violent, and even become deadly. In my life, I’ve never feared the police, much less feared for my life when interacting with them, and I likely never will. These privileges aren’t something that I earned. It’s just something that I have by virtue of being white in a country that carries prejudice around race. When I stop to reflect instead of being defensive, I can see why people of color would ask me to check my privilege. It’s because our experiences are completely different. In this case, a system that gave me this advantage (not being fearful of the police) also gave people of color a deadly and devastating disadvantage (unprompted, unwarranted, and often deadly use of force against them). When we acknowledge our privilege, we can see the ways in which our privileges are the flip side of a coin. On one side, we see the oppression of some and, on the other, the privileging of “majority” groups. Checking your privilege is about seeing both sides of the coin – and recognizing that in order for there to be marginalization, there also has to be privilege. Often times, we ask privileged folks to check themselves because we’re hurting. It’s actually painful when someone invalidates our struggles. It’s painful when someone can’t recognize the ways we’ve been marginalized throughout our entire lives – and that they, in some ways, have benefited from that. Even if your intention wasn’t to hurt anyone (and yes! we can give you the benefit of the doubt, while also asking that you reflect), when you’re asked to “check your privilege,” it’s important to recognize the harm that might have been done. Because while your intentions might be good or neutral, your impact was not. For example, in a previous article, I talked about the ways that I was ableist in my interactions with my disabled partner. “We all have problems; I wish you could just push through it” is something I said more than once – but after checking my privilege, realized was very problematic to say. It took some reflection to realize that I had the privilege of having the energy and physical ability to go out and work, while my partner was disadvantaged due to chronic illness and didn’t have these same abilities. What I said was hurtful, and while my intention was to motivate my partner to go out and achieve something, the result was that I invalidated their suffering and failed to recognize that our struggles are not the same. I also fed into larger societal ideas about people with disabilities being lazy or unmotivated, which is harmful on a broader scale, too. If you’re being asked to check your privilege, your instinct might be to defend yourself, to talk about your own struggles, or to derail the conversation entirely. But it’s important to push through that gut reaction and, instead, tune in to what’s being said. When someone asks you to check your privilege, it’s time to pay attention! 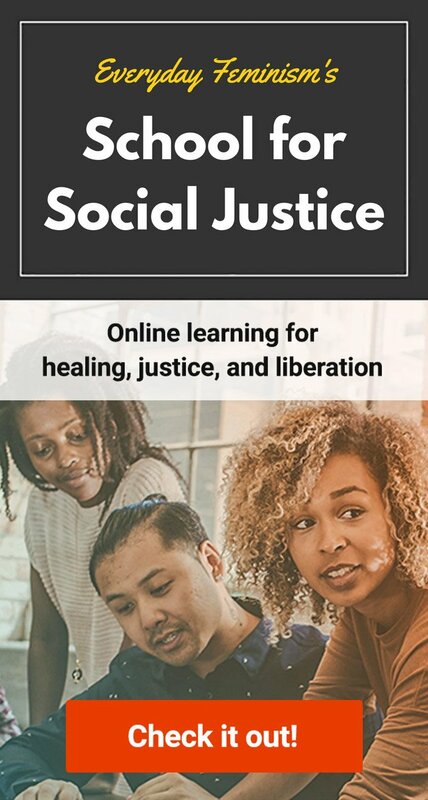 This is an opportunity to learn something from someone whose life experiences are different from yours – and a chance to come out of it as a better person and a stronger ally. No one wants to feel like they’ve done something wrong, and it’s understandable that you might want to get out of the hot seat. Even years into my activism, I still want to run away when others challenge me to check myself. That’s natural. When the spotlight is on you for the wrong reasons, it’s totally normal to look for an out. But if you insist on jumping in and steering the conversation off-course, or leave the conversation altogether, you miss a valuable chance to actually learn something (and, well, you make yourself look worse in the process). Even when it’s uncomfortable – especially when it’s uncomfortable – this is the time to tune in, and without demanding an education or being aggressive, let folks from a different perspective offer insight into their experiences. As privileged folks, we might also feel the urge to “tone police” – ignoring the message behind what’s being said and, instead, telling folks they’re “too angry” or need to “calm down.” But instead, I challenge you to recognize the pain that exists under the surface and honor the strength it took to open up to you. When a marginalized person is willing to give you a glimpse into their life, that in itself is a gift. Don’t waste the opportunity because you’re worried about looking bad or are preoccupied with your own feelings. Because, seriously, there’s nothing more impressive than learning from our mistakes and coming back as stronger and more compassionate people. And at the end of the day, that’s what “checking your privilege” is really about. Checking your privilege is hard. It’s uncomfortable. It’s scary. Because things won’t get better until people with privileges start to think critically about the advantages that they have. The system will remain the exact way that it is until people with power become willing to confront that power and work to even the playing field. Yes, I’ve struggled. My life hasn’t always been easy. But it would take a special kind of ignorance to say that my struggles are exactly the same as a trans woman of color who faces the threat of violence wherever she goes or the same as my disabled partner who is unable to rejoin the workforce. We aren’t the same. And acknowledging difference is an important first step in working towards equality. If we can’t recognize the ways in which we have privileges, we will be complicit in a system that rewards some and not others. We will be co-signing inequity. And I don’t know about you, but I don’t want to sign off on somebody else’s struggles.